Members of Club 64 will have access to all kinds of extras at the Credit Union! 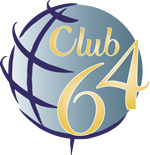 If you are 64 or better, make sure to stop by the Credit Union and ask about Club 64 today! The best part – if you are 64 or better; you are automatically enrolled!! ***Free Club 64 checks are Basic Checks – One order per year. Coin must be deposited into your account and Free Coin Counting day is the 4th Wednesday of the month. Limit 10 individual copies.